This RW&CO. wrap coat was love at first sight. When I first saw it in stores I had to get it and every year since then it's the first coat I take out of storage when the weather starts to get chilly. Every time I wear it, I get tons of compliments, from family, friends to strangers on the streets and trains. It's the perfect coat for autumn and those calm winter days. You can wear it just as a wrap coat or pair it with a chunky scarf or faux-fur collar. Another favourite of mine is the Babaton Bromley wool coat. 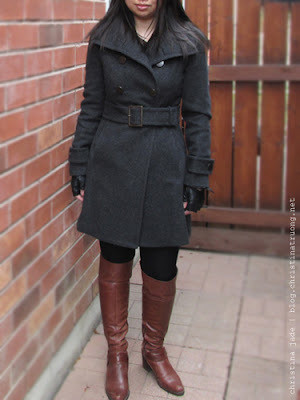 I love the minimalist feminine interpretation of a military coat and the amount of warmth the coat provides. You can wear the coat casually for the day or dress it up for the evening. Leave the collar down or pop it up for a more "cooler" look (and keeping your neck warm). And finally, my most worn and loved winter outerwear is the TNA parka. I loved it so much I had to buy another one. My first was the black one shown on the right. I've had this parka since 2006. From snowstorms, winter activities to yearly washes, it's been through a lot and still looks as good as new! So why another one? Mainly for colour reasons. This parka is super cozy with its faux-fur lining inside, ribbed wool cuffs and my favourite part, the rare earth magnet closures. 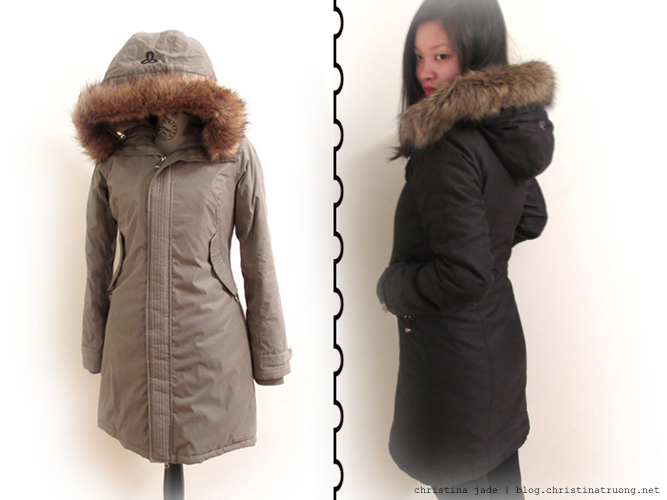 It's a great warm jacket that looks simple, not puffy and works with any outfit during any cold winter day. Warmth and style, you don't have to give up one for the other. Do you have a favourite winter outerwear? Hi Christina! I just pinned your picture and I'm wondering which style your TNA parka is? I love it! Thanks! LOL, sorry Christina -- I just clicked your link and realized its the ASPEN parka! So sorry! Great blog by the way! Hi! I am looking at buying the bromley coat but have no way of trying it on first. Do you mind sharing what size you bought? You seem like you're almost the same size as me :)!